Store bought almond milk was, up until two weeks ago, my favourite milk of choice. I’d put it in cereal, coffee, and all of my baking. However, I’ve recently come across some pretty disturbing facts about the ingredient carrageenan. It’s what they add so that your milk doesn’t separate and looks all pretty. Carrageenan has been linked to digestive system destruction, triggering an immune response similar to one your body has when invaded by pathogens like Salmonella. Naturally, I’ve done a complete purge of store bought nut milk, and am now making all of my own nut milk, primarily almond milk (thanks to my greatest investment: a nut milk bag). The only downside is that there’s no added vitamin D in my homemade almond milk. I’m not overly concerned about a deficiency during this beautiful summer we’re having, but come fall I will make sure I’m taking an adequate supplement. Making milk is easy, and it’s so satisfying knowing what you’re putting in it and where the ingredients are coming from! There are various recipes floating around the net, and they’re all similar, but here’s my favourite way to do it. 1. Soak your almonds in water overnight in the fridge. I’ve tried it after a couple hours, and it works…just not as well. 2. Drain and rinse your soaked almonds in a strainer, and then add to your blender of choice. 3. Add your 3 cups of water (or less if you prefer it more milky), your vanilla bean, your salt, and your cinnamon. Then blend on high for at least a minute. 4. 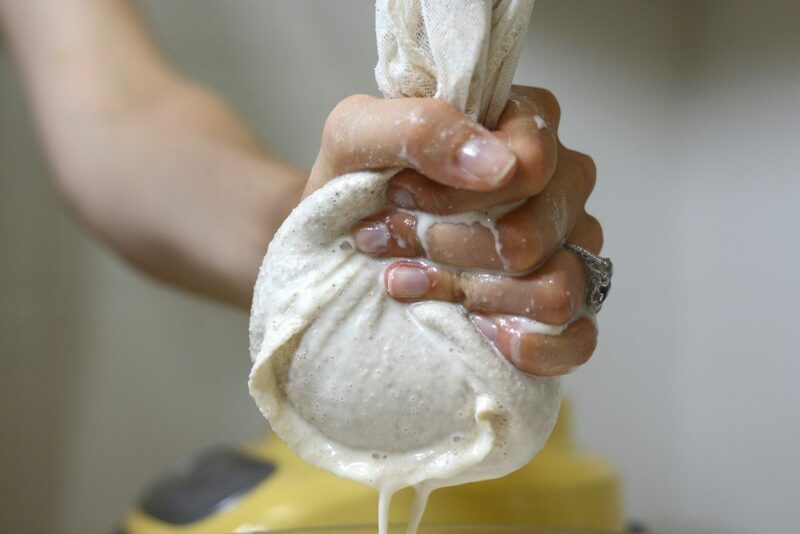 Next, place your nut milk bag – or cheesecloth – over a bowl (don’t try to do this directly into your milk storing container, you WILL make a mess). Slowly pour your milk into the bag until it’s all in there, and begin squeezing! This is the fun part. It’ll take a few minutes to get absolutely everything out, but you get quite a bit if you’re patient. Then transfer your milk into your storing container of choice. As you can see, it’s incredibly simple to do. Even better, there are way too many things you can do with the leftover almond pulp. I tried a hummus recipe – delicious, but I’m not 100% happy with it so I won’t be sharing it quite yet. But you can make muffins, cookies, pizza crust, etc! Yumm.